Most Exciting Player: Adam Haseley, Virginia. Haseley might be playing with a bone bruise, but he’s still a very versatile player who can make things happen at the plate and defensively as an outfielder. There is some concern, however, that Haseley might not be able to pitch this weekend. Haseley is hitting just shy of .400 and has enough speed to be a threat on the bases. Best Hitter: Pavin Smith, Virginia. Outside of UC Irvine’s Keston Hiura, many scouts would say there’s not a more pure hitter in college baseball than the hard-hitting Cavaliers junior. Smith is hitting .346, can hit home runs, can go gap-to-gap and more. He’s a consistent, big-time threat for the Wahoos. Best Defensive Player: Nolan Brown, TCU. The Frogs have consistently had good defensive outfielders over the years, most recently Cody Jones a couple of years ago. Well, Brown returned to the lineup from an injury this season and has been terrific out in center field. He covers a lot of ground and possesses a combination of good speed and instincts. Best Pitcher: Jared Janczak, TCU. The Horned Frogs just seemed to skip a beat when Janczak was out with shoulder bursitis. Well, now he’s back and throwing like his normal self, putting together a strong start in the Big 12 tournament. Janczak pounds hitters with fastballs and sliders low in the zone, and enters the weekend with terrific across the board numbers. X-Factor: Evan Skoug, TCU. With Luken Baker out this weekend and the rest of the postseason with an arm injury after having surgery, the Horned Frogs desperately need someone who can provide some serious power production. Skoug fits the bill with 16 home runs and 55 RBIs entering the weekend. 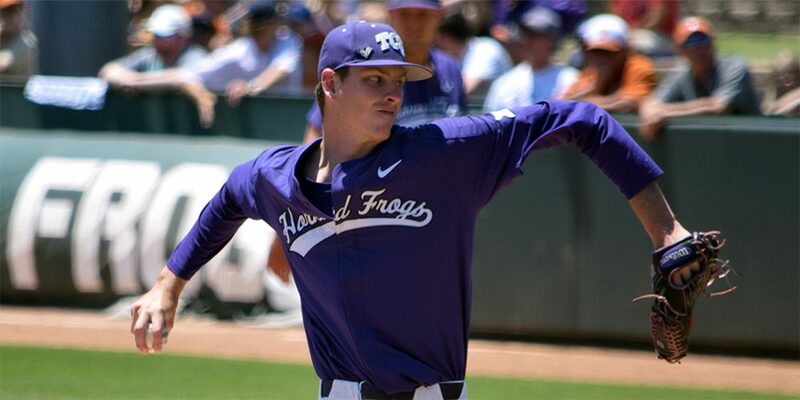 Best Starting Rotation: TCU. Offense is the name of the game in this regional, but keep an eye on the Horned Frogs’ rotation. Freshman lefthander Nick Lodolo has been hit or miss at times this season, but possesses a quality curveball and slider in the low-90s, while Brian Howard is a senior who steps up in the postseason and Janczak possesses a wicked fastball-slider combo. Best Bullpen: Dallas Baptist. Both the Horned Frogs and Cavaliers have some quality bullpen arms to watch, but my edge goes to the Patriots, which has the premier reliever in hard-throwing Seth Elledge. Elledge has big-time stuff with a fastball up to 94-95, while Dalton Higgins, Jimmy Fouse and Travis Stone are other relievers coach Dan Heefner likes to rely on. Best Offensive Team: Virginia. The Frogs are very, very good offensively when they get on a roll, but the Cavaliers have been the most consistent unit, entering the weekend with a .324 batting average. Virginia wants to make a statement at the plate this weekend with Haseley, Smith and Cam Simmons leading the way. The one negative? TCU’s ballpark typically doesn’t serve as a hitter’s paradise with a southern breeze most of the time. Best Defensive Team: TCU. The Frogs are very solid from a defensive standpoint. Elliott Barzilli has good command of third base, Ryan Merrill is a slick-fielding shortstop and Cam Warner is a quality defender up the middle as well. The outfield also is in good shape with Austen Wade and Brown leading the way, while Skoug is a veteran backstop who tends to step up in big situations. No. 1 Seed Win Probability (1-10): 5. Virginia will be without talented righthander Noah Murdock this weekend because of an injury, and Haseley’s availability on the mound is uncertain at the moment. With that, the Horned Frogs would need to do some things wrong to lose this regional as tough as it may look. The Frogs have a solid weekend rotation with Mr. Automatic in Janczak leading the way, while the offense is more potent than the overall numbers suggest. TCU should take care of business at home.